SCMP Group Ltd (SEHK: 583), Asia’s leading media holding company, announced today that the SCMP Charity Art Auction raised much-needed funds last night to help alleviate pressing community issues – impoverished children and seniors – through four social responsibility programmes run by St. James’ Settlement, the Society for Community Organization (SoCO) and the Tung Wah Group of Hospitals. Organised by the SCMP Group with patron sponsorship from Chow Tai Fook Jewellery and New World Development, the SCMP Charity Art Auction raised over HK$2.76 million from 16 fine art pieces and collectibles donated by established galleries, art collectors and artists from Australia, China, England, Hong Kong and India. Acclaimed artists include Zeng Fanzhi, Simon Birch, Sohan Qadri and Wilson Shieh. The auction, conducted by event partner Sotheby’s, was the highlight of a well-attended charity gala dinner at Grand Hyatt Hong Kong last night. 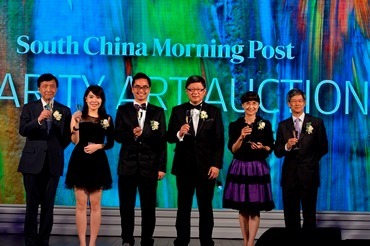 toast for the success of the SCMP Charity Art Auction. Soup Kitchen by St. James’ Settlement: To be set up at the Kowloon Kindness Centre, the programme will provide free soup for six weeks to people who are unable to cope with basic daily meal expenditures. Proceeds will be used to buy nutritious soup ingredients and the soup will be brewed without MSG. The Children’s Support Programme by St. James’ Settlement: It will provide holistic after-school support to deprived children and their families in the Sham Shui Po and Yau Tsim Mong districts through a variety of assistance and services, such as providing breakfast to supplement children’s nutritional needs, after-school support to underprivileged children, building up positive parent-child relationships and encouraging parents to foster a better atmosphere in which the children can develop. Physiotherapy and Occupational Therapy by Tung Wah Group of Hospitals: It provides assessments and interventions of physiotherapy or occupational therapy for deprived elders primarily to alleviate muscle and joint pain. Roadshows and talks will be held to promote musculoskeletal system care and home safety. Beneficiaries will include elderly singletons, aged couples, Comprehensive Social Security Assistance recipients and low-income elders in Wah Fu Estate and Wah Kwai Estate. The Home Modification Project by The Society for Community Organization (SoCO): This project aims to improve the living conditions of underprivileged families dwelling in dismal conditions, with a blueprint to create a more conducive learning environment in their homes. A professional steering committee will oversee design, effective installation of furniture, lighting as well as proper ventilation to create a better living environment. Throughout SCMP’s 111 years of history, it has collaborated with and launched a number of community campaigns and events that pulled together society support to improve the lives of the disenfranchised, including Operation Santa Claus, a partnership between SCMP and RTHK, which has raised over HK$211 million for 190 charitable projects in the past 26 years.